In the last quarter of 2017, I found my palate leaning more towards peated and in particular full-bodied smokey-sweet whiskies, which initially began with the phenomenol Paul John Peated Select 55.5%, which then lead me to experience the incredible Talisker 57 North and Talisker 18yo. I had my first experience of Caol Ila at Colin Dunn's tasting where I got to drink the absolutely amazing 12YO Feis Ile 2017, which is near impossible to find, but I tell you worth crossing borders for. The trajectory from that moment on has been, for the most part peated whiskies i.e. Talisker and the like. So, I began 2018 seeking more of the rich, sweet and peated whiskies in which case, I found myself naturally connecting with Islay. 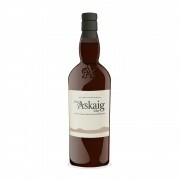 Enter Port Askaig 100 Proof: Port Askaig is a range of Islay single malt whiskies owned by Specialty Drinks ltd. (The sister company of Whisky Exchange) that embody the boldness of Islay smokiness and sweet fruitiness. It turns out that everything bottled under Port Askaig is in fact from Coal Ila as it is the nearest distillery to Port Askaig. I would say this is a great entry point into the world of Islay whiskies as I find the peat is incredibly well-balanced with the fruits. Palate: Warm cinnamon spices and wood smoke that isn't over-powering, but enough to bring you into its warmth. The spice continues to grow, where herbal peat and the fruity-honied notes unfold. Most noticeably cooked apples and figs. Finish: Enjoyably long and fruity; salted caramel. The smoke-peat lingers with hints of minerality. Verdict: Amazing value for money. If you like Caol Ila and looking to turn it up a few notches this will definitely hit all the right buttons. I really enjoyed the punchy waves of smoky peat, sweet fruits and minerality. For me, it packs a really good, delicious and warming punch. Nothing about it is over-powering in my opinion. I personally wouldn't add water - I just think the flavours are balanced so well, plus I enjoy cask strengths, so water would just muffle the flavours. "It turns out that everything bottled under Port Askaig is in fact from Coal Ila as it is the nearest distillery to Port Askaig." Is that confirmed? I always thought the "Port Askaig" whiskies were probably Caol Ila, not definitely Caol Ila—with Bunnahabhain being the next runner up.